The lead actors of MBC Wednesday and Thursday drama series The Moon Embracing the Sun during the beginning of the drama, Lee Min Ho and Yeo Jin Goo, stood side by side, exuding the charm of maturity. 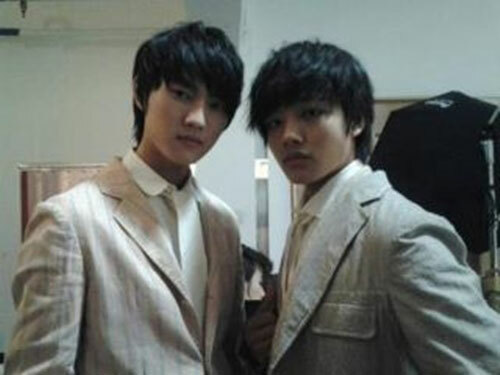 On the afternoon of February 12th, 2012, the photo of Yeo Jin Gu and Lee Min Ho was published on Facebook. In the photo, both persons wore beige suit, and stood side by side and put out a pose, attracting attention. The ratings of The Moon that Embraces the Sun exceeded 30%, the popularity is booming, the two persons who played the roles of young crown prince Hwon and young Prince Yang Myung have two tempted the hearts of countless women. Although they’re just in their teens, but they’re full of the taste of maturity. On the other hand, Yeo Jin Goo is making a sudden appearance in the “Sensibility” segment of Gag Concert. The filming for the role of Lee Min Ho in the SBS drama Rooftop Prince that debuts in March 2012 is also in full swing.